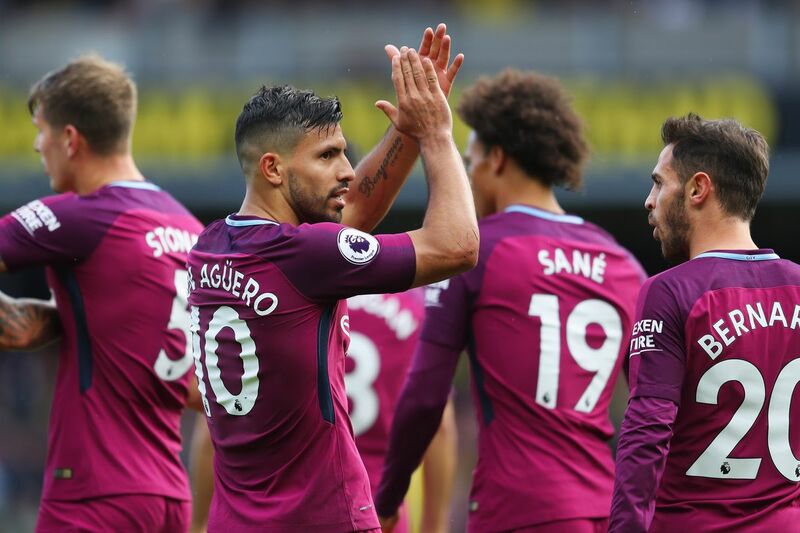 When Sergio Aguero helped Manchester City hit Watford for six last Saturday, he did so by chalking up his sixth Premier League hat-trick. Super Six – Sergio netted his sixth Premier League hat-trick for City at Watford, leaving him just three goals shy of becoming City’s outright all-time highest goal scorer. If he were to notch a magnificent seventh to shatter Roy Hodgson’s Crystal Palace, the Argentine super striker would smash City’s all-time goal scoring record which has stood for the past 77 years. 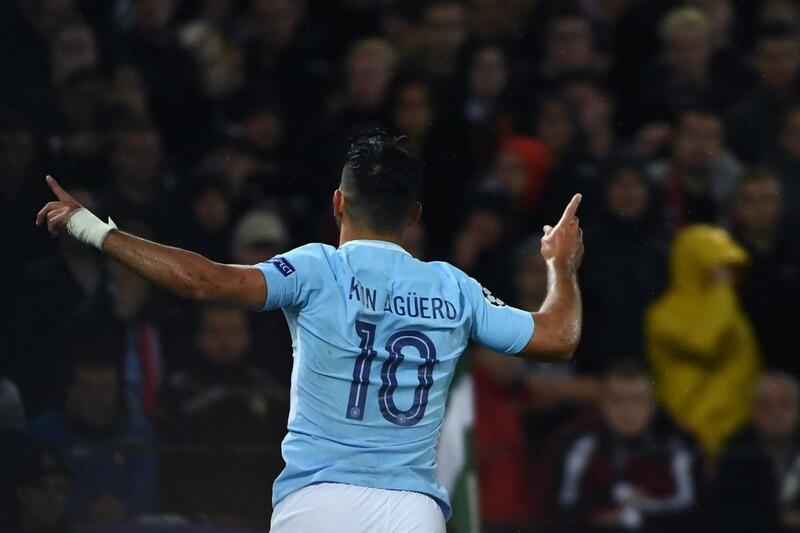 Aguero’s three goals in the 27th, 31st, and 81st minutes at Vicarage Road reminded us of his class not that any reminders were necessary after a breathtaking 175 goals in just 259 City appearances. Only a matter of time – Sergio is destined to become City’s record goal scorer…any time now! Brilliant bespoke image created by Stiz from our BlueRoom partners. City’s pocket rocket started as he meant to go on, bagging a brace and providing an assist on his stunning debut against Swansea City back in August 2011 – all that after coming on as a second half substitute! Roberto Mancini had landed City a £38m bargain from Atletico Madrid, a player who was destined for legendary status at the Etihad, a prolific scorer and truly authentic ‘world class’ marksman. Stunning debut – Sergio went on a duck shoot against helpless Swansea in August 2011. The City fans wouldn’t swap Sergio for any other striker in the Premier League back then or now, but despite his prowess and professionalism he’s often undervalued and seemingly discriminated against by non-City lovers. Ridiculously – almost criminally – in his six seasons in England, Sergio has never featured in a Premier League First XI selection when the ‘gongs’ are being handed out, either by his fellow professionals or the Football Writers’ Association. The Man with the Golden Boot – Sergio was the Premier League’s top scorer in 2015. He netted the Golden Boot Award in 2015, but Sergio lost his spot – at least statistically – as the Premier League’s top striker, due to the emergence of Tottenham’s Harry Kane. Kane is already marked as a favourite to retain his top scorer title this season, with many ‘pundits’ regarding Romelu Lukaku over at The Swamp as his biggest rival. That suits Sergio just fine. Two time Premier League title winner and hopefully more to come for Sergio and City. Ever the consummate professional, Aguero let’s his football do the talking with not so much of a whiff of controversy or ever seeking the limelight. Who knows, had Aguero been immersed in ‘cannibalism’ and biting opponents, or drink driving scandals, he might have caught more of the media glare and, perversely had a better shot at the glittering prizes! He already has two Premier League wins and two League Cup victories on his CV, and now, with Pep Guardiola at the helm, the best years are surely still to come for Sergio and City. 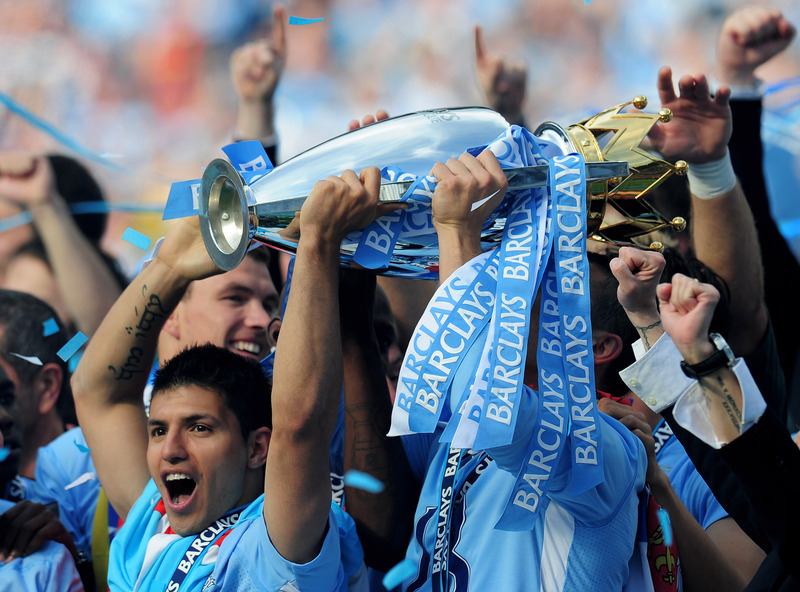 Sweet success – Sergio holds aloft the Premier League trophy after his never to be beaten last ditch winner against QPR in 2012. 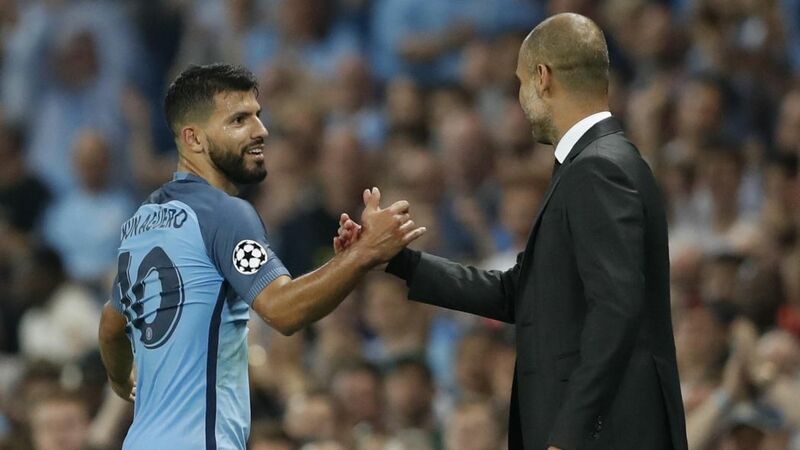 Despite rumours of friction between City’s manager and his star striker, it’s fair to say Guardiola has helped make Aguero a more complete player – a goal maker as well as a goal taker. Sergio’s contract at the Etihad presently runs through to 2020, so what’s to say he won’t create a new goal scoring record that will never be surpassed? Together – Pep and Sergio can take City to dizzying new heights in the next three years. As it is Aguero has hit 175 goals in just 259 City appearances. This contrasts with Eric Brook, who currently holds the record, having notched his 177 goals over the course of 453 appearances between 1928 and 1940. Brook, like Aguero, was regarded as one of the finest forwards of his generation. He was a title winning City champion, back in 1937 but, unlike Sergio, suffered the ignominy of being in a City side relegated the following year in 1938 – the one and only time the defending Champions of England have been relegated! 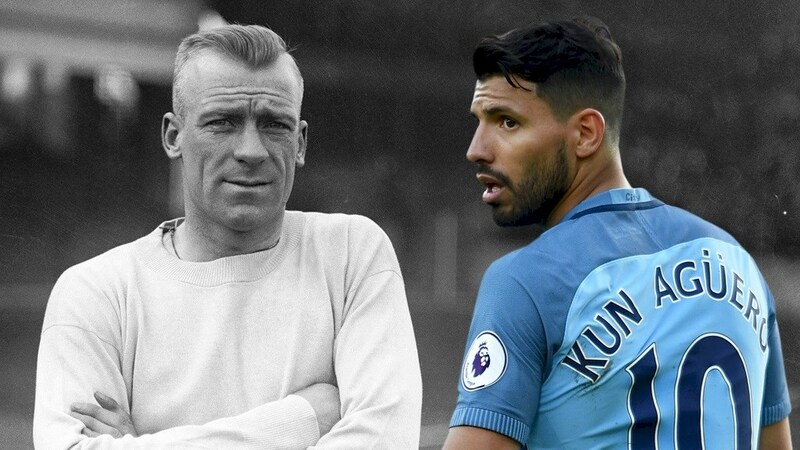 City Legends – Eric Brook and Sergio Aguero. He does however have one up on Sergio, having won the FA Cup in 1934, when City beat Portsmouth 2-1 with Brook’s England team mate, Fred Tilson, scoring the 88th minute winner. Brook scored 10 goals in 18 England appearances but, after suffering a fractured skull in a car crash in 1940, the City striker was forced to retire at the age of 33. Come in No 10 – City’s all-time goal scoring record beckons for Super Sergio. Looking at how long it took Brook to hit 177 goals, it’s clear that Aguero is by far the deadliest scorer in City’s history and, as he homes in on the record, we’ve selected five of Sergio’s most memorable strikes to savour. City fans will differ as to their own personal favourite five – it’s very subjective – and we’d love to hear your own selections. The only FA Cup match on the list, but it’s one City supporters will remember fondly, especially Read But Never Red, as we were perfectly in line with Aguero’s looping header as it eluded Petr Cech. 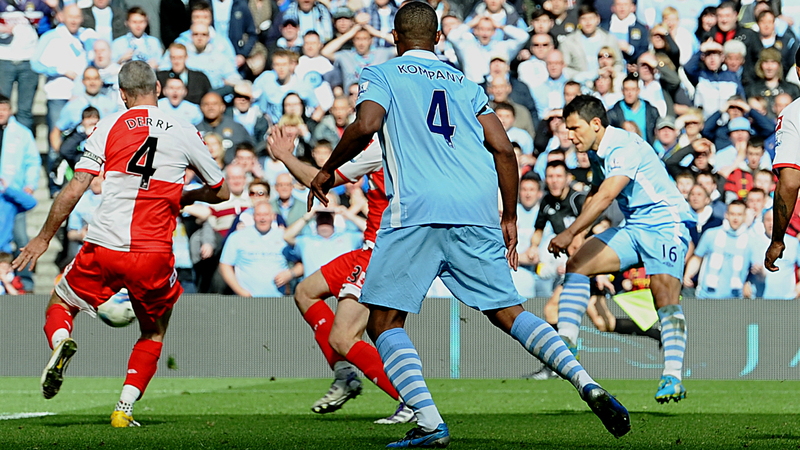 City were already up 1-0 after a Samir Nasri strike, when Sergio connected with a long cross from Gareth Barry. The ball seemed to hang endlessly in mid-air before dropping into the Chelsea net. Amazing anticipation and execution – Sergio’s brilliant finish against Monaco. This one has lost some of its shine given that City ultimately went out of the Champions League over two legs, but that disappointment shouldn’t dull the thrill of a goal which illustrated Sergio’s predatory instincts and technical ability. Losing 3-2 at home, it wasn’t looking good for City until Aguero, seemingly anticipating a missed header from a melee in the 18 yard box, waited patiently to volley home direct from a corner. Sensational finishing in a pressure cooker atmosphere. Sergio stumbled but it was United who fell 2-1 on the night. You couldn’t have a Sergio Selection without at least one inclusion from a Manchester Derby match, and this has to be his best to date. City were already well on the way to relinquishing their title to their hated rivals, but nonetheless had a golden opportunity to make a point by taking all three points at the Theatre of Screams. Tied at 1-1 Aguero more or less took matters into his own hands (or feet), beating pretty much the entire United defense, nearly tumbling to the turf but just managing to fire a rocket shot past David de Gea into the top of the United net. Beauty and the Beast – We signed Kun Aguero – they signed Phil Jones! The goal is famous for the excruciatingly weird expression on the face of United defender Phil Jones – handsome he most certainly is not! In terms of pure football skill this could well be Sergio’s most impressive City goal. Trailing 2-1 to the always loathsome Liverpool, City were desperate for an equaliser. An errant pass to Aguero wound up trickling away to the far side of the box. Sit down celebration with Liverpool on their knees – Aguero’s incredible equaliser for City has to be seen to be believed. 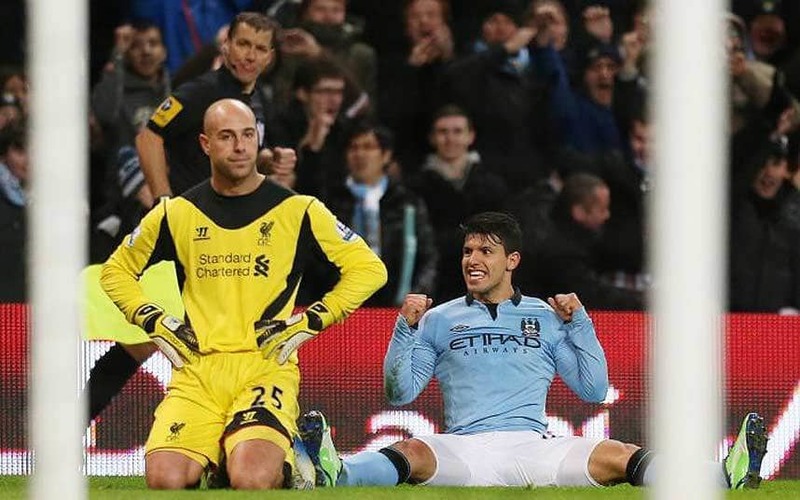 For reasons best known to himself, Liverpool keeper Pepe Reina came way off his line to clear the ball but Aguero beat him to it, before proceeding to defy the laws of physics, flicking the ball into an empty net from a near-impossible angle. It’s a goal you can watch 100 times…and then a hundred times over again. AGUUERRROOO – The most exciting climax to a Premier League season ever! Let’s face it there was only ever going to be one Number One in the sumptuous selection of Sergio’s goals and it only needs one descriptive word – AGUERRRRRROOO! 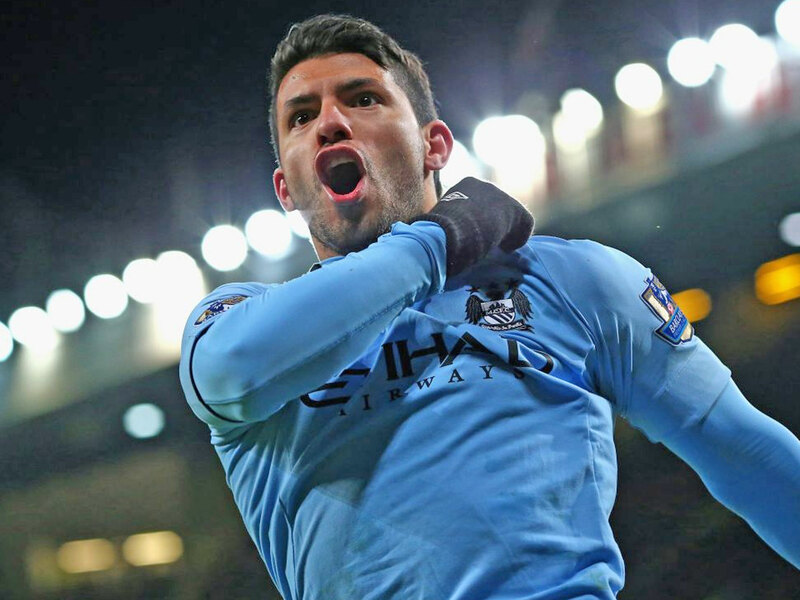 That goal, that celebration…The Aguero Moment! 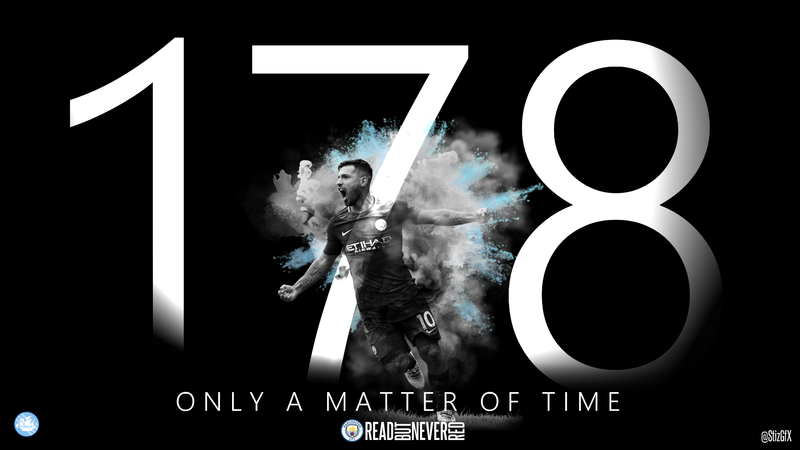 It’s been a pleasure and a privilege to watch Aguero in City’s colours week in and week out, and with the prospect of another three seasons at the Etihad, the club’s goal scoring record could well be nudging the 250 mark by the time we bid adios to the Boy from Buenos Aires. Sergio – Passion Pride Power & Precision – City’s Finest. Muchas gracias Sergio largo puede reinar supremo! A brilliant goalscorer and consummate professional. While the press tried to stir up a split between Sergio and Pep after Jesus's arrival, the man himself acted professionally and respectfully never giving anyone a reason to think he wasn't happy with his situation. Excellent synopsis - City would be most unwise to even think about parting company with a world class striker who has three years left on his contract. Jesus shows every sign of being a future great - it's not as if he isn't doing the business now - but he will surely evolve into a player of Neymar-esque proportions and City will get all the benefits. Nonetheless Aguero is City's main man as he has been for the past six seasons and he has never ever shown any indication that he wants to leave. He has done everything asked of him since Pep's arrival and this is reflected in improvements in his all round game, his work rate off the ball and, as witnessed in recent matches, a selfless attitude in providing assists and penalty taking opportunities to Jesus and Raheem Sterling. Probably so Ed - bloody scandalous isn't it when you think of two Premier League titles and the likes of Kompany, Yaya, Silva and Aguero four 'world class' players. 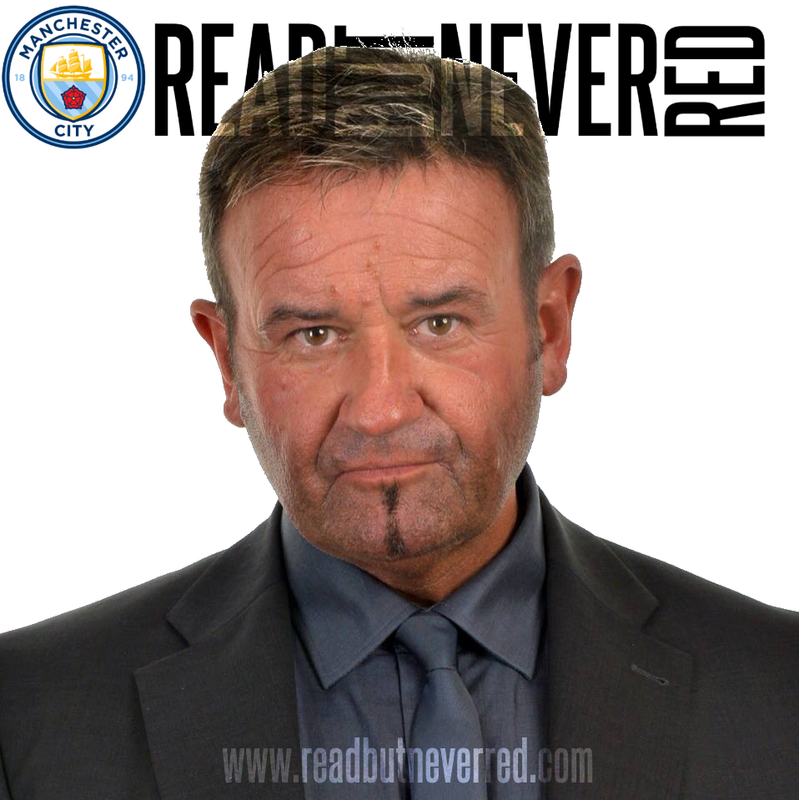 Going forward, if City win the title, you would imagine it should be nigh on impossible to ignore the claims of Mendy, Jesus, De Bruyne, Aguero and Silva et al...but I'm sure they'll find a way. As a gambling man - and I know you're a pretty good one - I might follow you on an Aguero hat-trick. There were also some pretty wild odds on City breaking or matching the highest ever score in the Premier League, I think it was 9-0 at odds varying from 500/1 down to 250/1. So many wonderful memories for every, man woman & child who has blue coursing through their veins. That moment alone can reduce any Blue to a bubbling wreck welling up with tears & emotion. When he breaks the record it will confirm what we all know Sergio is the best ever! Yes, so much to reflect on and enjoy with Sergio, and hopefully so much more to anticipate and celebrate with the great man. Tina Turner sand a song about him...'Simply The Best' ;-) Thanks mate. The guy is just pure class Dave, & we are so lucky that he has stayed with us. He could walk into any side in the world. He is a pure footballing genius. Love your piece on the great man Dave keep them coming. That record edges ever closer after his headed goal against Palace - he could easily have had the required hat-trick on the day, but it's coming. Sergio is so much a part of the fabric of modern day City and, as you say pure class and a joy to behold. Many thanks Doug. Let's see if he can equal and surpass the record on a Champions League night at the Etihad.